Some facilities are looking to higher education partnerships to shore up coding staff levels, even if it means developing an in-house training program. The effects of supply and demand—perhaps the most basic economic principle—are wreaking havoc on HIM recruiting and retention efforts. It’s a challenging situation, as multiple clinical and regulatory initiatives require a heightened focus on high-quality coding resources while an experienced and available workforce continues to decrease. HIM departments have faced an ever-worsening shortage of qualified coders for several years, and while no one can accurately predict the extent of the deficiency, some industry estimates point to a nationwide shortage as high as 30% to 50%. The situation has been compounded by several factors, including a growing population of older adults who will require more health care services and an aging coder workforce that the industry may lose to retirement over the next decade. Faced with ongoing recruiting challenges and the seemingly forever-looming ICD-10 deadline, Memorial Hermann made the strategic decision to develop partnerships with nearby universities to recruit and train graduating seniors with bachelor’s degrees in HIM. The organization has taken the initiative to create its own formal inpatient coding education program that is carried out on site and administered by internal staff. Because such programs provide a win-win situation for hospitals seeking qualified employees and university graduates looking to land that first job, it’s an idea many in the industry believe will spread. Mary Worsley, MS, RHIA, CCS, an associate professor and program coordinator for the health information and informatics programs at Miami Dade College in Florida, says the school has established similar key partnerships with local hospitals such as Baptist Hospital of Miami, Palmetto General Hospital, and Mount Sinai Medical Center. The program, which allows students to participate in internships, provides needed on-the-job experience for students and opportunities for hospitals to identify potential new hires. 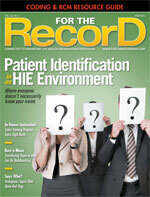 When it comes to ICD-10, the HIM recruitment challenge for many hospitals is a double-edged sword. While lean staffing models already place significant strain on coder productivity, the coming regulatory transition will only heighten the need for hospitals to continue to do more with less. Regarding coder shortages, Worsley suggests that past attitudes about hiring qualified and experienced coders have limited hospitals’ ability to identify appropriate new hires. Simply put, inpatient coding departments have been reluctant to dedicate resources to internships and training programs that could open a larger pool of potential candidates. “Productivity does lag when you have students in hospital internship programs, but there are benefits in the long run,” she explains. Now faced with the complexities of the ICD-10 transition, HIM managers are changing their outlook on the benefits of in-house training, especially in light of the fact that some coders who have been in the industry for many years under ICD-9 are reluctant to learn the new system. Worsley points out that it’s much easier for a coder to transfer from ICD-10 to ICD-9 than from ICD-9 to ICD-10. At Lake-Sumter State College in Leesburg, Florida, the HIM program’s advisory committee features representatives from all large and many medium-sized health care facilities and physician practices, including two accountable care organizations. The college partners with each entity to offer low-priced continuing education training for existing staff members who need to be up to speed on ICD-10 coding and documentation requirements. Graduates also can visit specialist sites, contract to help a practice make the ICD-10 transition, and fill open coding positions as long as they have obtained their RHIT or CCS credentials. According to Ziesemer, building trust between providers and faculty is the first step toward getting an effective recruiting and training partnership off the ground. She adds that health care organizations often need to be educated on the value of using graduates or students to help prepare for the upcoming documentation and workflow challenges. “It’s easier for graduates to get jobs with experience, but partnerships also provide a good resource for partners who are willing to hire an inexperienced but strong worker to code,” Ziesemer says. Following on-site interviews at Memorial Hermann’s Houston hospital, eight graduates were chosen from an applicant pool of 23 to participate in the first training program that began last July. Candidates who enjoyed reading (there would be many medical records to peruse) and had a predilection for working from home were a step ahead of the competition. Applicants also had to provide details about their interest in the coding profession and their ability to adjust to an evolving work environment. “Given the six months allotted to train graduates, we felt the HIM graduates would have the basic skills in coding necessary to transition to inpatient coding,” Wheeler says. Establishing attainable goals and objectives must form the basis of any successful internship program, Worsley says. “Some internships have elaborate goals that are not reachable,” she says, adding that both colleges and health care organizations must be realistic about what situations students can be exposed to in a given time frame. Memorial Hermann’s program provides six months of on-site training in both ICD-9 and ICD-10 coding. The objective is to teach ICD-9-CM coding at a hospital level while incorporating ICD-10 education. Current members of the inpatient coding staff served as mentors to the inaugural eight trainees, answering questions about the coding profession in general and guiding the newcomers through day-to-day operations. For example, the trainees became familiar with workflows, attended educational meetings, and experienced computer-assisted coding implementation. To help with training, Memorial Hermann employed AHIMA’s Web-based Coding Assessment and Training Solutions and Precyse’s ICD-10 online modules. In addition, Faye Brown’s ICD-9-CM Coding Handbook and Coding Clinic served as centerpieces for chapter-specific discussions. Following the completion of each chapter-specific guideline, trainees were given a list of actual medical records to code online that were applicable to the most recently read chapter. The instructor reviewed any coding errors, discussed the rationale behind the code selections, and answered student questions related to the exercise. After three weeks, trainee progress was measured, and those demonstrating a greater understanding of coding were allowed to advance in the program. After five weeks, it was determined that the students could be divided into three levels of coding expertise. Subsequently, adjustments were made to train the students based on the rate they were able to master concepts and their ability to code accurately. Students also were given assignments based on their progress. For example, one student, who was coding all types of inpatient records with greater than 90% accuracy, was placed on prebill review. Within seven weeks of classes, three other trainees were placed on prebill review, with the remaining four students attaining that level three months into the program. By the end of the six months, Wheeler says all trainees were coding independently while maintaining quality and productivity standards. After one year, trainees—who are required to make a two-year commitment to Memorial Hermann—are advised to sit for the CCS exam as an inpatient coding specialist. The ability to train and recruit future HIM professionals in a real-life setting generally is a winning proposition. In fact, partnerships between academic institutions and health care organizations can be invaluable on several fronts. “Both parties learn and develop their skills better, and employers learn about potential employees,” Worsley says. Wheeler says don’t expect the arrangement to come cheap, noting that department budgets will take a hit from training costs. The salaries of new graduates and a qualified instructor, along with material costs stemming from the purchase of PCs, education materials, and online tools, can add up quickly, she notes. At Memorial Hermann, matters were complicated by the logistics of identifying appropriate and safe low-cost housing for graduates who made the commitment to relocate to Houston for the six-month training program. Nevertheless, the program’s benefits outweighed any inconveniences and financial concerns. With unbilled days at fewer than two, HIM workflows at Memorial Hermann are keeping inpatient coding current. Wheeler also points out that raising staffing numbers to their optimum level has greatly reduced overtime, even in the midst of conducting ICD-10 training throughout the organization. In addition to those benefits, Memorial Hermann believes it is now sufficiently staffed to handle any productivity declines related to the introduction of ICD-10. The numerous achievements have more than offset any hardships endured, Wheeler says, noting that expectations were met. “We satisfied our main objective, which was to be fully staffed,” she says. Apparently, hospital leaders took notice. “Based on how successful the program was, Memorial Hermann is reviewing an educational model with a focus on outpatient coding,” Wheeler says.